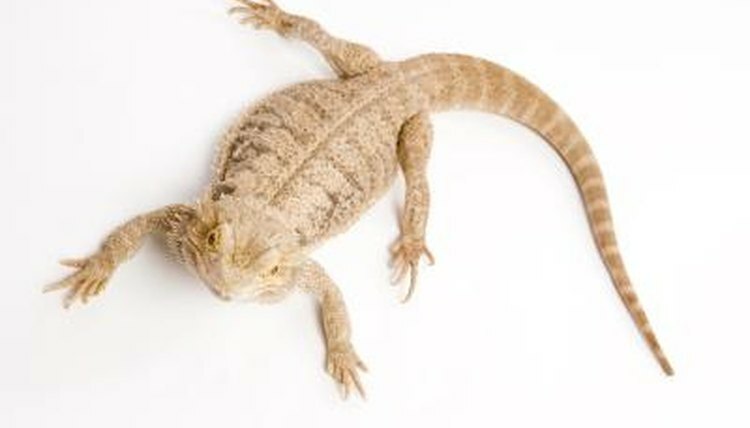 Bearded dragons are among the best pet lizard species for beginners, and captive bred individuals are readily available. One of the few downsides of these lizards is their voracious appetites -- you have to keep live crickets and other insects handy. Commercial bearded dragon foods and packaged insects are available and easier to use than live insects, but getting your lizard to recognize the dead bugs as food can be challenging. It is important that your bearded dragon eats crickets or some other insect diet, but your bearded dragon doesn’t necessarily need to know he's eating crickets. Hide a few canned crickets in your bearded’s vegetables. Hopefully, the bearded dragon will not notice the crickets and will just gobble them up with the vegetables. Even if your lizard notices them, he probably won’t mind the hidden bonus. This technique also works well with commercial pellet foods. The nice thing about this technique is that it doesn't require much additional time or effort. Though it takes time, patience and perseverance, you can get most bearded dragons to accept dead crickets from tongs or tweezers. Grab a cricket with the tweezers and move it around as though it is alive; experiment with your technique until you find what triggers your individual dragon to eat. Only use plastic or rubber-tipped instruments, to avoid hurting your dragon’s mouth. You can simply use your hands to feed your lizard, but it is possible that your dragon will nip you when trying to eat the item you're offering. This is the most fun method, though it may require patience and skill. Place a few canned crickets on a paper plate or feeding dish in front of your lizard. Using a hand-held misting bottle, adjust the spray so that it comes out in a focused stream. Using your best sharp-shooting skills, squirt the crickets with small blasts to make them move. The water will have the additional effect of distributing the smell of the crickets, which may further entice your lizard to eat them. Try not to get your dragon wet during the process, as that may elicit drinking behavior and distract them from the business of eating. Some commercial manufacturers produce vibrating food dishes to encourage bearded dragons and other lizards to accept commercial food. This method can be effective, though it requires you to remove the bowl when the lizard finishes eating. Vibrating feeder dishes startle some lizards.